The year 2018 was a great learning year for the small-cap investor. Some of the small-cap stocks saw a massive correction in 2018. Investing in small cap is great for return, but it also means they are a riskier asset to own as well. I prefer small-cap stocks to add the multiplicative factor to my overall portfolio. The same also applies to the mutual fund as well. The small-cap fund can add the boost to the overall portfolio. Having exposure to the small-cap fund can help boost the performance. So let’s begin finding the best small-cap fund to invest in 2019. The most important factors we will consider for selecting the best small-cap fund will be the consistency of its performance in the small-cap segment. The process we will use is- from the 4 and 5-star rated small-cap fund by ValueResearchOnline, we will compare the performance in the past year, compare expense ratio to get the best small-cap fund for 2019. We nail down to a fund that has a lower expense ratio and has fallen the least in the past one year despite a very significant correction in the small-cap index. HDFC Small Cap Fund has scored well on both the fronts – one-year performance in the falling small-cap segment as well as the expense ratio. The fund outperforming the index is because of its resilience to fall in the falling market between September and November. Without a doubt, it is the best small-cap fund to invest in 2019. How The Best Small-Cap Funds of 2018 Performed? As per the ValueResearchOnline, Small-Cap Fund Category has given a negative return of more than 20% in the past year. The funds we selected as the best small-cap fund of 2018, though has also provided a negative performance in the past year, has outperformed the underlying benchmark by a significant margin. SBI Small & Midcap Fund – Has been renamed as SBI Small Cap fund due to stricter SEBI guidelines on fund classifications. It has given a negative return in the past year and has slightly underperformed the small-cap fund category. 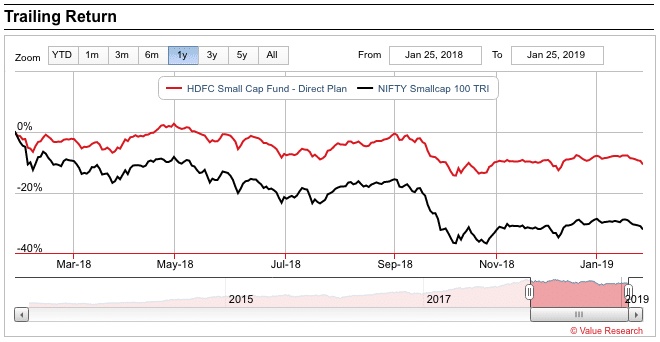 HDFC Small Cap Fund – It has given a negative return in the past year but has majorly outperformed the small-cap fund category. 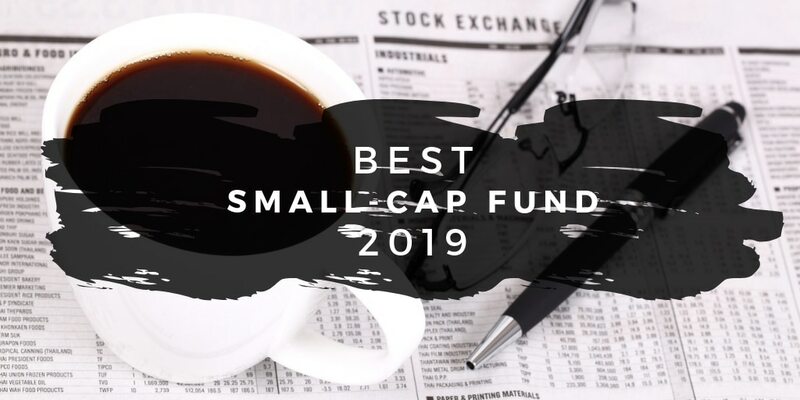 So it is the best small-cap fund of 2019 as well. L&T Emerging Businesses Fund – It has given a negative return in the past year but has outperformed the small-cap fund category. 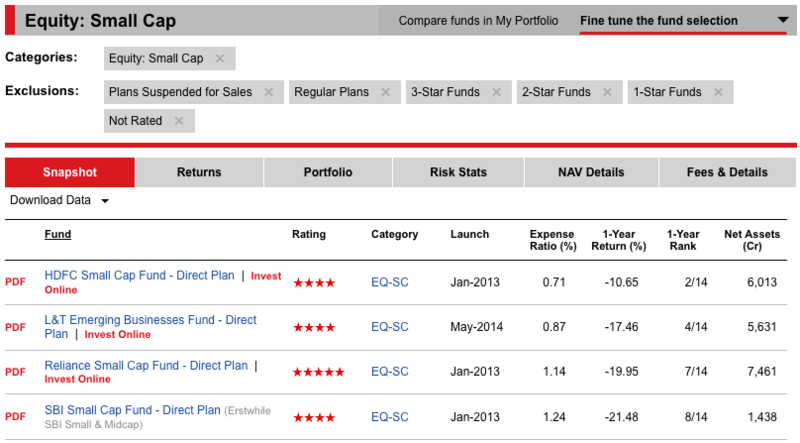 Out of the three funds, only one fund has slightly underperformed, but the other funds have outperformed. Small-Cap fund should be a small part of the portfolio unless you can handle the high volatility without being too concerned about it. Don’t always consider the returns as the point to invest. Assess the risk associated when investing in the small-cap fund or stocks.